Amy's Creative Side: Happy Valentine's! 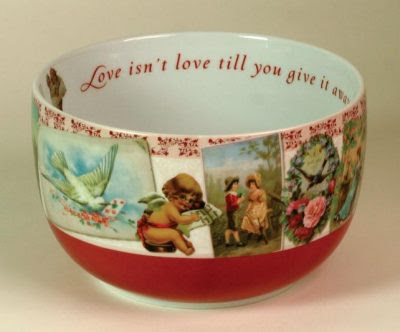 My sentiment for the holiday - "Love isn't love till you give it away." I pray that you are blessed with love today and always! I've been quiet here - sorry. I've been feeling the effects of a snowy week, without much sunshine, and I'm not used to that around here. And I've felt inclined to snuggle up with a book(s) instead of quilting. Have you read the Elm Creek Quilter's Books? I've been trading books on PaperBack Swap and loving it! So far I have read the first 4 of the series and have my eye out for the rest! 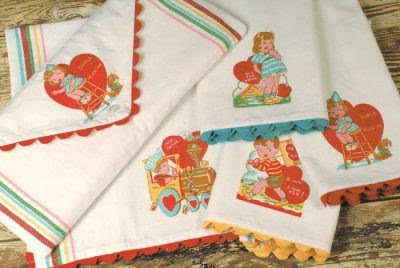 The retro Valentine towels are too too cute! Wouldn't be hard to make either . . . hmmm. I've been way behind for Valentine's this year. I haven't even gotten the kids' stuff wrapped yet. Happy Valentines day! Yes, I have have read them all and love them. Happy heart day to you too Amy!! Thank-you for the link to the towels, they are so cute!! Cute Valentine stuff! Nothing better than snuggling up with a good book. I've read a few of the books but not in any order. I have A Quilters Homecoming if you're interested. Ha! My mom takes that catalog and both of those things caught my valentine-y eye the other day when I was looking through it. Hope you had a Happy Valentine's Day! Those tea towels are adorable. Thanks for the links. The boys love the snow but wish it would let up enought that I would feel safe letting them drive up the canyon to the resort. Today would have been fine but A is sick now. What a bummer. Just wanted to say thanks for the staple gun tip. Oh and love the towels there from Moda Home, I design finished products for them. Hopefully by now a happy Valentines Day has been enjoyed by all. Nice how it takes so little do be a sweetheart to someone. Those towels are very cute indeed...you should make some up, show us how it's done. I have enjoyed all of the Elm Creek Books, borrowed them from my library. A book swap is a good idea. Sure is okay to feel the need to be quiet when the weather gets to be too much, gets to me too. I droop like a flower when the sun stays away.